One of the best heels today. Kevin Owens. WWE is turning Sasha into the worst champion in terms of title defenses. Rod Strong is now a heel? Ngayon ko lang naintindihan yung hype para kay Kairi Sane. Damn, she good. share lang guys, whoaa nintendo DS graphic designer! With AJ Styles moving on to the WWE title, gaano kaya katagal bago maging irrelevant ang US title. Ang sakit panoorin si Finn Balor ngayon. Just turn him heel, gumawa ng grupo since 'kinakalaban' naman nila yung Bullet Club, the rest is gravy. There's a reason why the Bullet club is so over even before Kenny and Cody arrived. But then again, alam naman natin ang dislike ni Vince sa mga stables. Mukhang tapos na naman ang feud with Bray don't worry. 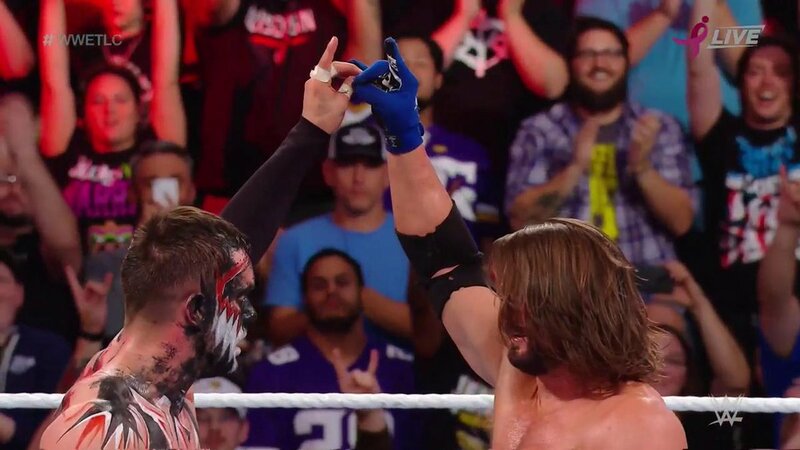 It's gonna be AJ Styles vs Finn Balor at TLC! Hanep!!!! Don’t forget Kurt Angle. Oh it’s true! Sayang nga lang yung Kurt Angle return na build. Expected ko pa naman yan after RR next year. Speedy recovery sa mga nagkasakit. Meningitis pala yung kumalat. Can't wait for the Styles-Balor match later!